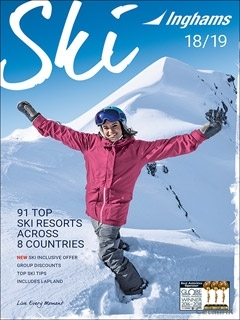 To order a printed copy of the Inghams 2019 Ski brochure, simply click the Request button below. The number one Operator for Skiing and Snowboarding presents a fresh brochure for the Winter 18/19 season. This brochure is packed full of fantastic Ski holidays across Europe and North America, in all the top resorts. It features a great range of money saving offers that can save you up to £1162 per couple. The brochure also features Santa Breaks and Winter Activity holidays in Lapland. All Inghams ski holidays are backed by their reliably high service standards, 85 years of ski experience and passion for the mountains. They know what makes your ski holiday work, and they look forward to welcoming you to the slopes with them this winter for another fantastic ski season. Request your Brochure now and hit the slope for less this year! By pressing the Request Printed Brochure button you give consent to Inghams 2019 Ski (and their Data Processors for the specific purpose of delivering your literature) to send you their Brochure .